When your goal is to accentuate an object’s motion, choose Shutter Priority mode on your Canon EOS 7D Mark II. When you take pictures in Shutter Priority mode, you choose the shutter speed and the camera supplies the proper f-stop value to properly expose the scene. Your camera has a shutter speed range from 30 seconds to 1/8000 of a second. 1Rotate the Mode dial to Tv. The mode dial is located on the left side of the top panel. 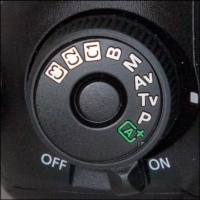 2Rotate the Main dial to choose the desired shutter speed. As you change the shutter speed, the camera determines the proper f-stop to achieve a properly exposed image. If you notice that the shutter speed is too slow for a blur-free picture, you have to put the camera on a tripod or increase the ISO speed setting. If you see the minimum aperture (largest f-stop value) for the lens blinking, the image will be underexposed with the selected shutter speed. If you see the maximum aperture (smallest f-stop number) blinking, the image will be overexposed with the selected shutter speed. If you choose a shutter speed that’s too slow for a blur-free picture, mount the camera on a tripod or choose a higher ISO speed setting. 3Press the Flash Compensation/ISO button and then rotate the Main dial to change the ISO speed to the desired setting. Choose an ISO setting that enables you to achieve the desired shutter speed. 4Rotate the Main dial to choose the desired shutter speed. 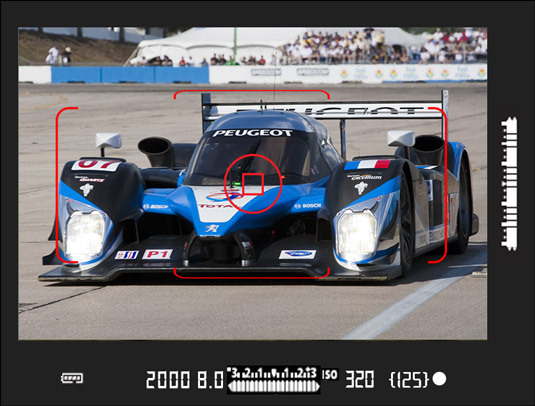 As you rotate the dial, the shutter speed value changes on the LCD panel and in the viewfinder. 5Press the shutter button halfway to achieve focus. A green dot appears in the right side of the viewfinder. If the dot is flashing, the camera can’t achieve focus. If this occurs, switch the lens to manual focus and twist the focusing barrel until your subject snaps into focus. 6Press the shutter button fully to take the picture. Shutter Priority mode is the way to go whenever you need to stop action or show the grace of an athlete in motion. You’d use Shutter Priority mode in lots of scenarios. The image on the left was photographed with a slow shutter speed, and the image on the right was photographed with a fast shutter speed to freeze the action.